What was notable about Obama's win in the South Carolina Democratic primary (Republican primary already happened) was how big it was. Most people expected Obama to win it, but it was going to be close. Which direction would the "black vote" go? In the past, the Clintons were well supported by African-Americans. Today's numbers? 80% supported Obama. But he doesn't want that to be his message. I watched his speech tonight, and it was impressive. I actually got goosebumps twice. As an orator, he's significantly better than the other two Democrats. Several things he said that I noted, and make me wonder if I'll wind up voting for him. Speaking of politics, he said that the current climate is too partisan. We can't even acknowledge when a Republican has an idea! he says. And he vowed change. I don't know if he can change that, but I like the message. Speaking of race, he emphasized both black and white relations and black and latino relations as areas we can still be better in. I do believe that race relations can be improved by national leadership. Twice he mentioned this idea of Republican voters crossing over in order to vote for him. One of his examples was a former staffer for controversial South Carolina politician Strom Thurmond who today was knocking on doors for Obama. In other politics news, Huckabee still seems willing to defend McCain when even though they are in competition. 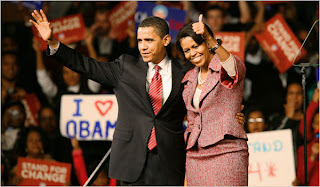 And whoops - back to Obama (and this could be big) - the only living daughter of JFK officially endorses Obama as like him.